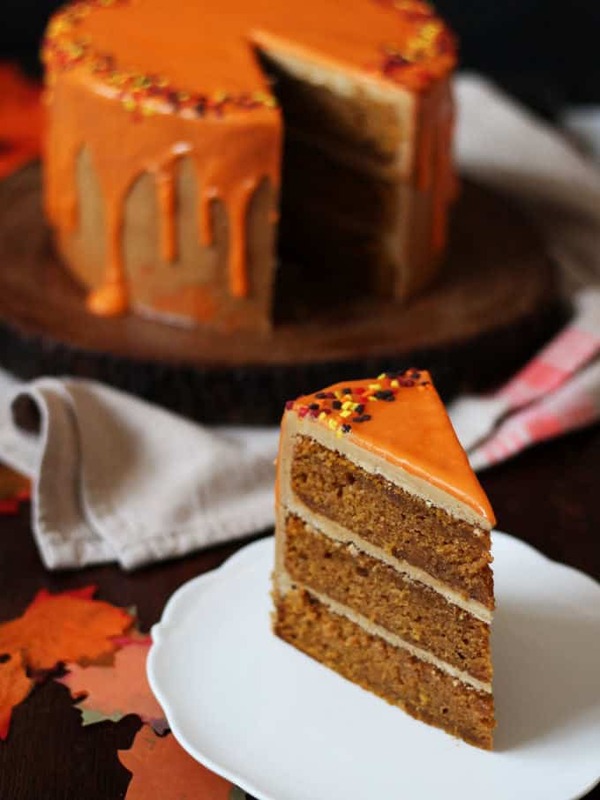 THE Pumpkin Spice Latte Cake – layers of soft pumpkin spiced cake, with fluffy latte coffee buttercream frosting and a white chocolate ganache drizzle. It’s the most wonderful time of the year… Autumn is here, hurrah! Much as I love sunny days, that first nip in the air, the whiff of a log fire and a tartan scarf are definitely reason for celebration in my eyes. It signals all of the important questions for me. How soon is too soon to light the log burner? Where will I buy the ultimate brown leather boots? 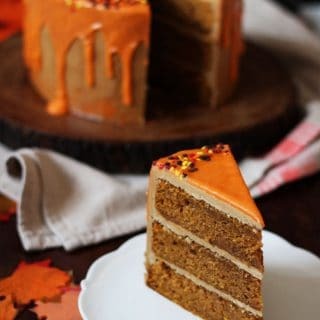 And, how to make a Pumpkin Spice Latte cake? These are the questions weighing heavy on my mind at the start of the season this year. Please tell me I’m not alone?! I’m so ready for the cosy, hibernation afternoons and evenings that autumn brings. For us millennials, there’s nothing like marking the changing of the seasons with a Starbucks cup (I know, sad but true). 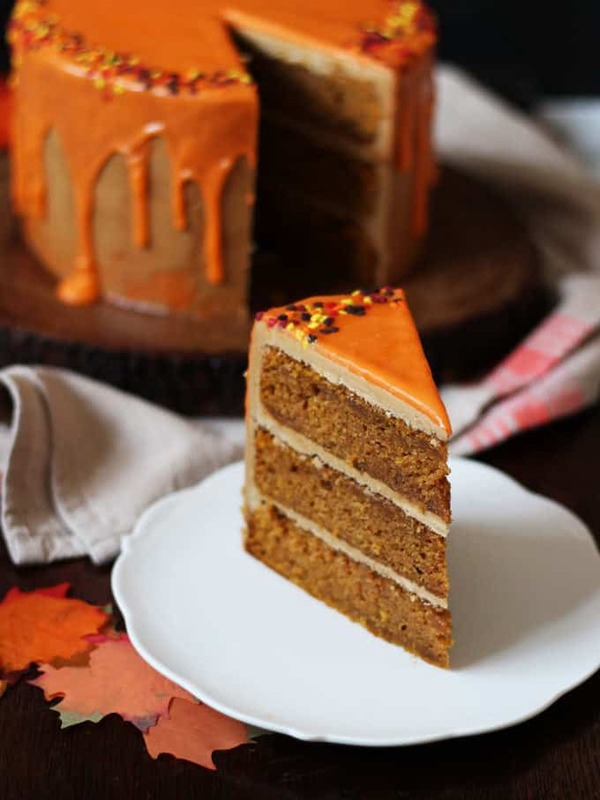 So, when I saw those Pumpkin Spice Latte Starbucks signs appear a couple of weeks ago, my mind wandered to themed cakes. 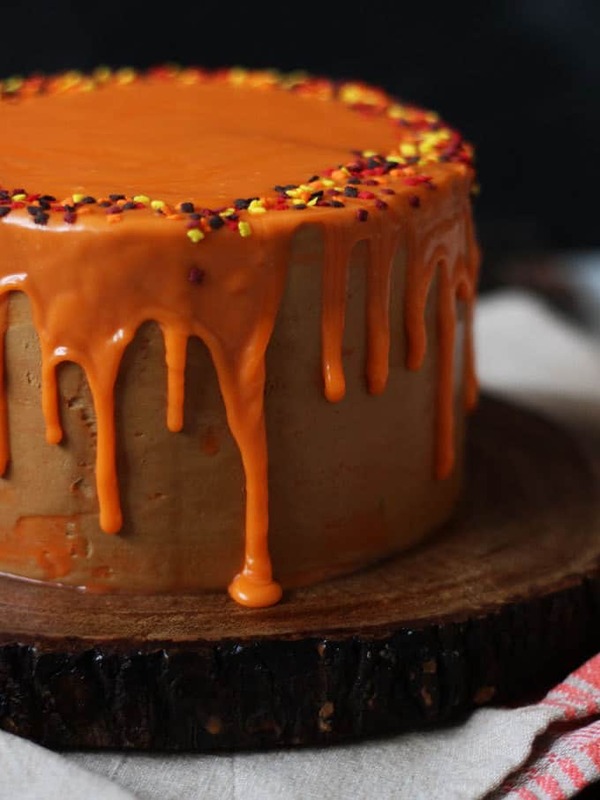 It is a close textured cake, but meltingly soft. 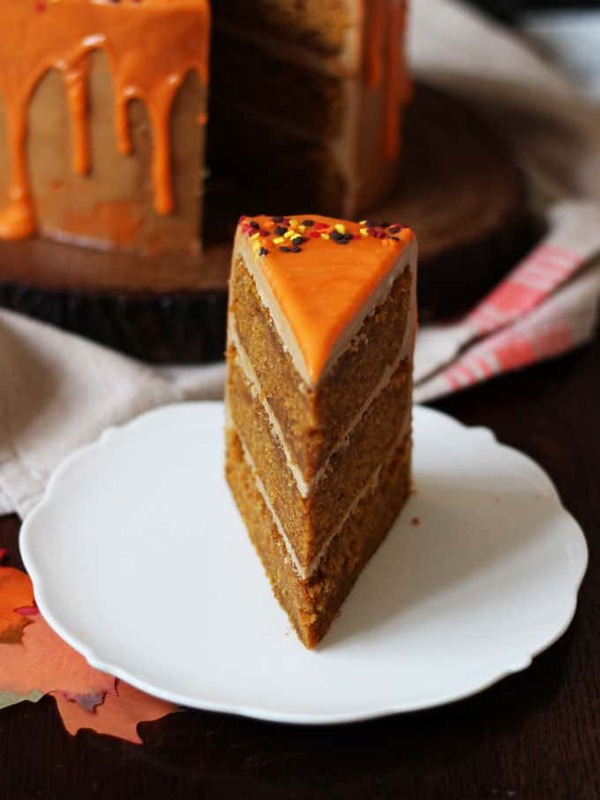 It’s rich, so you only need a small slice, but oh my, that pumpkin spice, along with the coffee frosting? It’s asking to be eaten under a blanket by a log fire. Make sure you use gel/paste food colouring suitable for use with chocolate. These are the only ones I recommend and use (available from Amazon): Tangerine Food Colour Paste. Bake for 35 - 45 minutes or until a skewer comes out clean. Allow to cool and then carefully turn out from the tins. Whilst they are baking or cooling, make the icing. Mix the coffee with just enough boiling water to dissolve it. Allow to cool. Beat the butter until light, fluffy and pale. Add the cooled coffee and mix in well. Sandwich together with the coffee frosting, so you have a stack of 3 cakes. That looks absolutely amazing, those layers! Thank you Carolin, so pleased you like it! Thank you Donna! It’s a good ‘un even if I do say so.. I love autumn too! Oh wow! 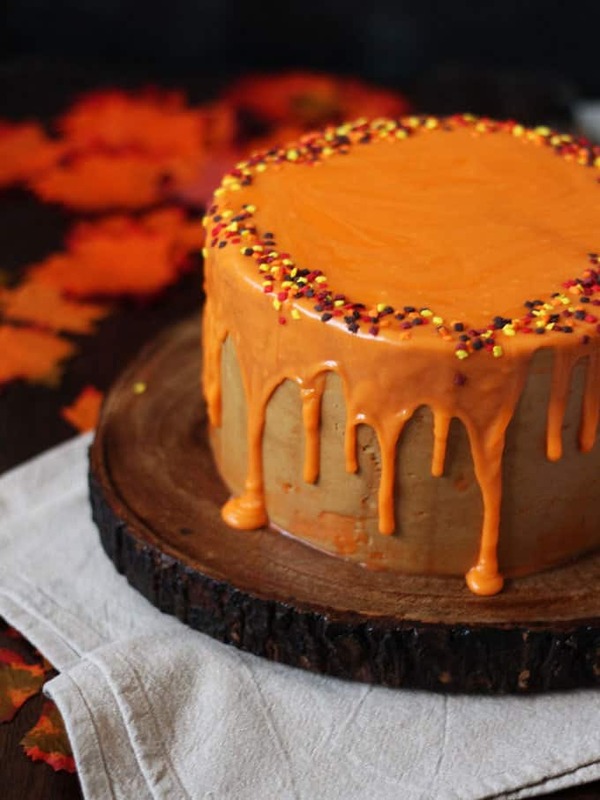 Sarah you certainly know how to make a cake, and this one really captures the feeling of those autumnal months. 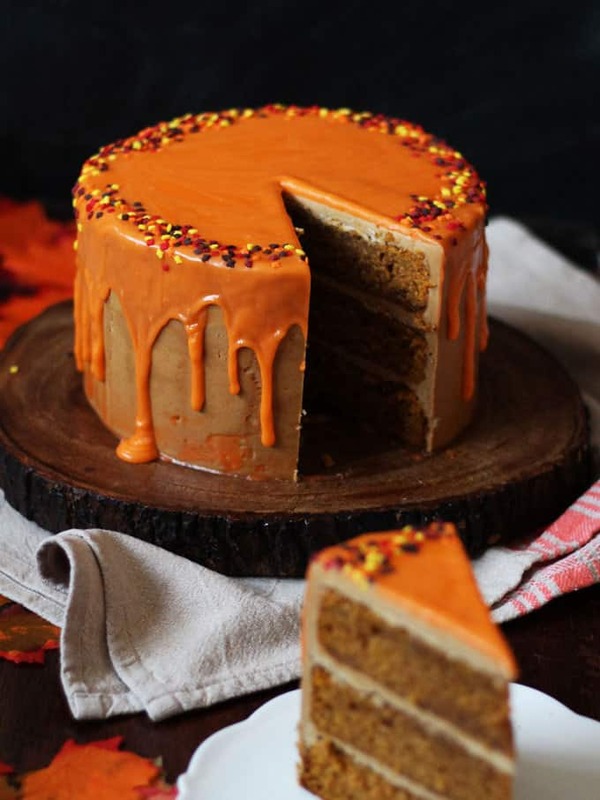 This looks delicious, the decoration and layers are stunning! Great photography too. I may have missed it somewhere, but I couldn’t find a measurement for the baking powder… I kinda just guessed and it turned out alright, but just thought I’d let you know. Hi Neva, I never ever recommend using cups as they are so inaccurate compared to weighing. You can read more about it here: https://www.joyofbaking.com/WeightvsVolumeMeasurement.html investing in some digital scales will change your baking forever! If you do still want to try the recipe you can Google for each conversion. Hope that helps!